Diligent anglers continued to capitalize on the good number of sport fish in Monterey Bay this week. Windy conditions created some frustration however. Small craft advisories were issued nearly every day last week, and most persisted into the evenings. The best fishing conditions were early mornings. This weekend’s forecast predicts much of the same with winds of 15 to 25 knots expected on Saturday. Sunday, Monday and Tuesday the wind forecast drops to 10 knots, with a negligible swell. If the forecast holds true, we may have ideal fishing conditions. Rockfish and lingcod fishing remains good and it’s getting better. Most Monterey Bay charter operations reported limit-style fishing this week despite the winds. Chris’ Fishing Trips from Monterey continues to focus on the bigger lingcod available near Point Pinos and Carmel Bay. Because of the large bait they use, clients aboard the Check Mate bagged only half to three-quarter limits of rockfish but caught full limits of lings on every trip. Near Santa Cruz, the Mega-Bite with Tom Dolan at the helm fished local reefs for big rewards. Dolan took advantage of decent morning conditions on Saturday and provided his clients with a fish-fest. He reports, “Water was flat calm until the wind came up around 11 then it blew hard. We got into a really good morning bite catching more than 150 fish but just keeping 50 (limits) nice blue, black, olive, brown, and red pacific snapper and two lingcod.” Jim Rubin, on the beautiful Miss Beth also fished the local reefs this week and reported catching a variety of rockcod including blues, blacks, yellowtail and vermillion. Most of the halibut trollers are working 60-70 feet of water for bigger fish. The smaller male halibut are already moving into shallow water where drifting bait or throwing swimbaits can be very productive. 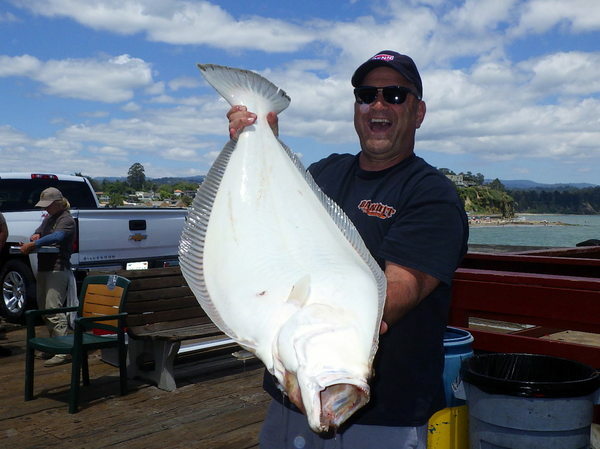 Ed Burrell at Capitola Boat and Bait counted legal-sized halibut caught near the Mile Reef and near the Sponge Bob Buoy, which is anchored in 40 feet of water. Reports also came in of multiple halibut caught from the Santa Cruz Municipal Wharf by anglers using bait or plastic swimbaits. Most of these fish were less than 22 inches, which is the minimum size for keeper halibut. The sheer number of fish hooked bodes well for the upcoming weeks of halibut fishing.